In any democratic country of the world, the constitution always stipulates that a citizen must be tried in the open, this is to maintain/enhance the peoples confidence in the country's judicial system. I have never heard of anywhere in a civilized country where a citizen is tried in the secret except on certain cases of high level of terrorism charges. 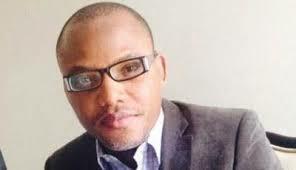 Mazi Nnamdi Kanu, the leader of Indigenous People Of Biafra IPOB and the Director of Radio Biafra/TV was charged with some bogus charges of 'treasonable felony', 'managing an unlawful society' among other lesser charges. The above mentioned charges are clearly bailable and NOT supportive of secret trial in the Nigerian constitution, infact, there is no provision for secret trial in the Nigerian constitution. One now begins to wonder where or in which constitution Justice Binta Nyako used to justify her ruling on December 13, 2016 over the secret trial of Mazi Nnamdi Kanu. The answer is not far fetched. A deal was reached between Muhammadu Buhari and Justice Binta Nyako. Binta NYAKO had to deny the IPOB leader bail, approve a secret trial and possibly jail him, in order to save her husband and son from the criminal charges leveled against them by the government. This is the condition given to Justice Binta Nyako by Muhammadu Buhari. The federal government had enormous evidences to jail former governor of Adamawa, Gov. Nyako for his role in sponsoring Boko Haram and money laundry activities. Plans have been concluded to put the terrorist (Gov. Nyako) behind the bar, but the trial of Mazi Nnamdi Kanu presided over by Ms Binta Nyako has provided a worthwhile hope for the Nyako's family. Justice Binta Nyako accepted Buhari's offer and commenced the process of jailing IPOB leader, she started by denying him bail and subsequently approved a secret trial, in order to pave a way for the evil ambition.However, IPOB worldwide has rejected and exposed their evil plots to the world. The Nigerian constitution does not guarantee for a masquerade trial; the public accusation and assault launched against Nnamdi Kanu by Muhammadu Buhari has even made a secret trial a grievous injustice, as you can't accuse someone publicly and try the person secretly. Muhammadu Buhari has been gripped with fear, as Nnamdi Kanu's trial have transformed into a global case. Nnamdi Kanu has the evidence to put an end to Nigeria, and this has been a nightmare to president Muhammadu Buhari; hence his desperation to jail the IPOB leader through the back door. "Buhari killed my people in the public, he accuse me in the open and now he want to try me in the secret, he is a mad man, go and tell Buhari that he is a mad man, he is not intelligent enough to jail' - these were the words of IPOB leader, Mazi Nnamdi Kanu, while he was reacting to the secret trial ruling by Binta Nyako. Nnamdi Kanu's thunderous voice on that 13th Dec 2016 in Justice Binta's court trembled the sit of power in Aso Rock. As our great leader rightly declared; there shall be no secret trial, none whatsoever. Secret trial is inconsistent with any known democratic constitution. IPOB worldwide say no to secret trial. Free Nnamdi Kanu, Free Biafra.